When Is It Time to Replace Your Treadmill? Posted on September 28, 2017 , in Treadmill. How old your treadmill is or how many years of usage it has received is not reason alone to replace it. A quality treadmill can last for many years and withstand frequent usage, however often after a treadmill is over a decade old, it may be difficult to obtain parts for repairs. Some repairs may be simple, but if a critical component such as the drive motor, motor controller, walking belt or deck are no longer being manufactured, you will most likely need to replace your unit. 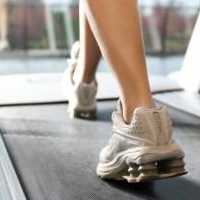 Often, the belt on a treadmill will be an indication that your unit may need maintenance or a replacement. Look for frayed edges, a sluggish belt movement or if it feels like the belt is slipping when you are using the machine. If you are going to try and replace the belt, you will need to know what to look for and how to test the belt, which we will explain below. Before you inspect the belt, make sure to unplug your treadmill. Begin by loosening the belt so that you can feel the interior surface and visually inspect its appearance. Use a screw driver that will fit the units tension roller bolts, which are located on the back of the treadmill and carefully loosen the belt. Once the belt is loose, feel both sides and look for areas that have uneven wear. If parts of the belt are very smooth on the areas that you walk or run on, this is an indication that the belt needs to be replaced. Also, if you find any cuts or snags in the belt, replace before using the machine again as this can cause a safety issue. Find where the seam of the belt is and check for any wear and tear on the top of the belt seam. If there are any frayed edges, replace immediately as a loose seam can be very dangerous and injure someone using the treadmill. To inspect, run your hand on the inside of the belt and feel for any signs of damage or rough edges. Is It Dangerous If You Don’t Replace It? If your belt is damaged make sure to replace it and if in doubt, it is better to be on the safe side and replace just to be sure and not risk being injured. If the electrical components on your treadmill have failed, you will probably need to look at purchasing a new machine. Newer treadmills have many features and options that may not have been available when you purchased your last machine. Advancements in energy efficiency, heart rate monitoring, interactive programs, Bluetooth capability and even built-in televisions are common on most of today’s high-quality models. Another major bonus that many people find when they replace their older treadmill is how quiet newer models are and comfortable the running deck is. Some top of the line treadmills are self-lubricating, however, others will require a special wax to lubricate the components several times per year. Before applying any wax or lubrication, make sure to review your owner’s manual to follow the specific instructions for your model. New treadmills will come with pre adjusted belt tension, however, after repeated usage, the belt will begin to stretch out. If your belt becomes too loose, it will start slipping while you are walking or running. Other times, the belt may become too tight which can cause damage to the motor and rollers. The belt tension can be adjusted by tightening the bolts, but always consult the owner’s manual first for instructions. All treadmill belts will require occasional alignment from time to time. The belt should run straight down the centre of the deck and if it isn’t, this is an indication that it is time to make a small adjustment which can be done by adjusting the bolts on the rear of the machine. If you have decided that is it time to replace your treadmill, download our latest promotions to save on a new, high-quality machine.